The ex-Ma Tau Kok Animal Quarantine Depot, commonly known as the Cattle Depot, is the only surviving pre-war cattle slaughterhouse in Hong Kong. It was built in 1908 and was a slaughterhouse and quarantine base until mid-1999. The rear portion was built in the 1950s to 1980s, and became an extension of the depot. The front part of the depot was made into a village for artists in 2001. Currently, there are 12 tenants in the village, who are individual artists or part of art organizations. After the Kowloon City District Council suggested revitalizing the 6,000 square meter area to create more public spaces near the village in 2016, construction began to convert the rear portion of the depot into an art park. Wong wrote that the project is close to completion, and estimated that the park will open its doors to the public in mid-2019. 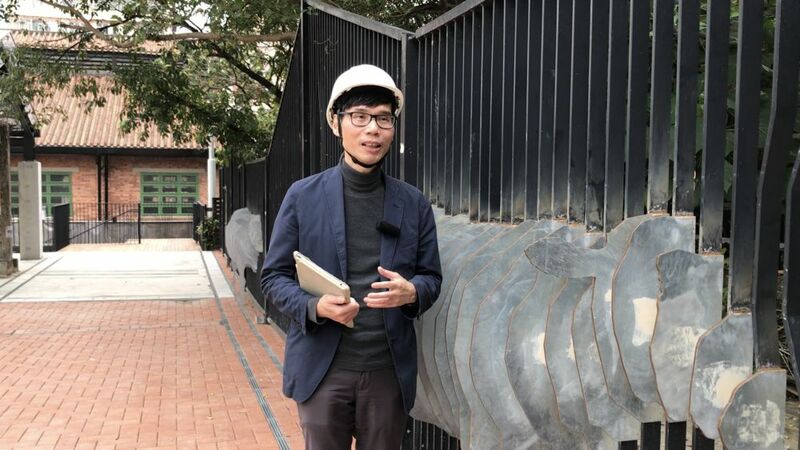 Jacen Lo Chi-sing, a senior architect at the Architectural Services Department, said the architectural design team has tried to maintain the historicity of the cattle depot, including the feeding trough, water channels and metal rings that used to tire the cows. "[It] is a Grade II historic building," he said. Lo added that a huge stone at the rear portion of the depot used to be an "extremely important place." "Every morning, cows were brought to the rear portion of the depot and temporarily kept in cow sheds. The buyers would gather before the huge stone and bid for the cows," he said. Lo said the new facilities at the park, which includes a rain shelter, were built while keeping the architectural design of the old cattle depot in mind.